Air Liquide is the world leader in gases for industry, health and the environment, and is present in 80 countries with close to 50,000 employees. Oxygen, nitrogen, hydrogen and rare gases have been at the core of Air Liquide’s activities since its creation in 1902. Using these molecules, Air Liquide continuously reinvents its business, anticipating the needs of current and future markets. Innovative technologies that curb polluting emissions, lower industry’s energy use, recover and reuse natural resources or develop the energies of tomorrow, such as hydrogen, biofuels or photovoltaic energy. Air Liquide combines many products and technologies to develop valuable applications and services not only for its customers but also for society. The Group has designed hydrogen refuelling stations that can fill the fuel tanks of vehicles with hydrogen gas in under five minutes with a pressure of up to 700 bars. At this point, more than 60 of these stations have been installed by Air Liquide. Air Liquide is pleased to be part of this collaborative project and to prepare the future of hydrogen Fuel Cell Electric Vehicles (FCEVs) in the United Kingdom by providing all its expertise regarding hydrogen refuelling infrastructure and hydrogen. 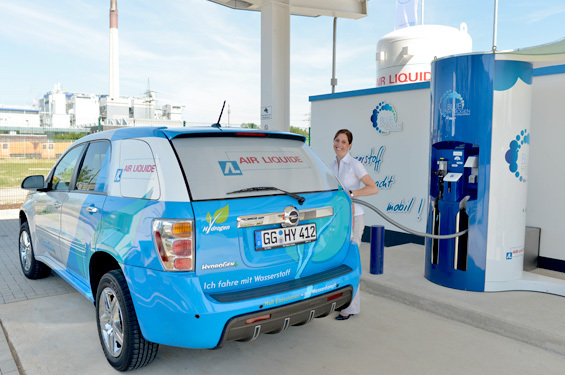 Air Liquide will contribute to define and evaluate ways to roll-out a national hydrogen infrastructure for ultra low carbon vehicles in the UK and propose its refuelling solutions for the expected market deployment of FCEVs in the coming years.